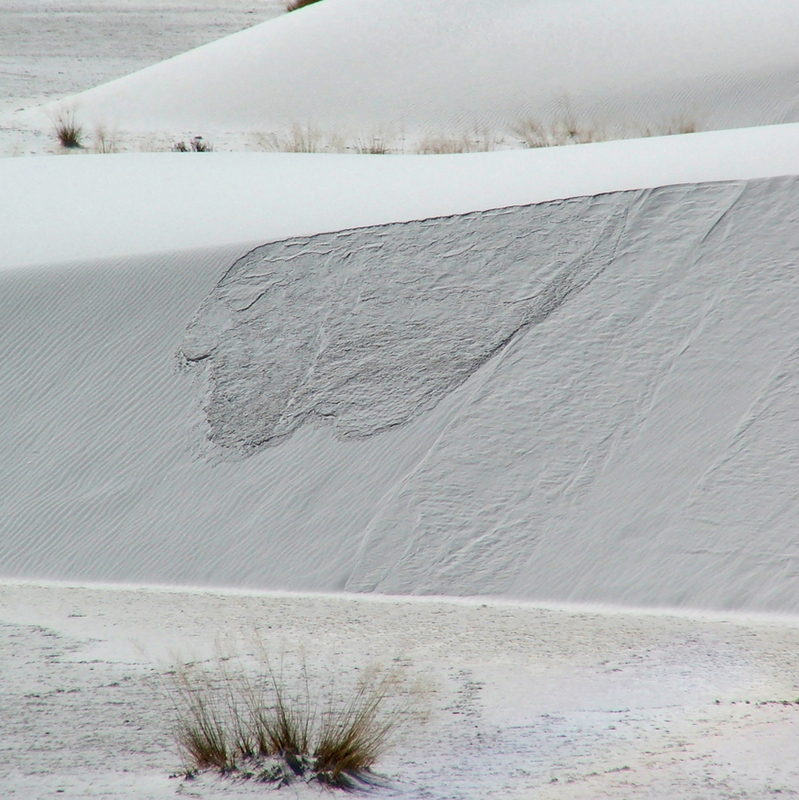 This week’s Friday Field Foto is from White Sands National Monument in New Mexico and is inspired by a recent post on Through the Sandglass blog about sand dune cross-bedding in action. As sand grains (in this case, the grains are made of gypsum) saltate along the dune surface by wind they reach the crest and begin to pile up in the ‘shadow’ of the wind. Then, every once in a while, a threshold is reached and a small flow of grains — a little sand avalanche, if you like — occurs moving a mass of grains down the slip face. This happens repeatedly and in different spots along the dune resulting in migration of the dune over time. This avalanching of sand grains is preserved as cross-stratification in the dune* and, if the geologic consequences are right, that dune will be preserved and lithified in the record as beautiful cross-bedded sandstone. I also picked this photo for this week to get you all in the mood for a special event next week here on Clastic Detritus. Last August I posted a review of the book Stories in Stone and then a Q&A with the author David B. Williams. Next week I will be doing a very similar event about the fantastic book Sand written by Michael Welland. Most of my readers already know about Michael’s blog Through the Sandglass, which is an outgrowth of his research on sand for his book. On Wednesday of next week I will post my review of the book and then on Thursday Michael and I will post a Q&A that we hope readers will participate in. Lockwood, that’s a great question … I’m not sure. The thing is that most preserved dune sequences are capped by some transgressive unit indicating they were buried (and essentially drowned). I’m wondering if a rising water table would dissolve a gypsum eolian sequence such that preserving it would be uncommon. But, that’s something worth looking up. Anyone else got an answer for Lockwood? If the rising water table was saline enough, it might not necessarily dissolve the gypsum… but it occurred to me as I thought about your response that recrystallization was probably unavoidable. And that might wipe out any primary sed structures that would point to an eolian genesis. In other words, there might be such outcrops, but they’re not recognizable as such. Yeah, that’s true … maybe not dissolved but some kind of alteration seems likely. But, you never know, it always seems like there are examples in geology where all the conditions are just right to preserve just about anything! Tell him to put his book on Kindle. White Sands is one of my favorite places. Great place to take kids. Is a great example of a ‘Stokes Surface’. I must admit that I had never heard this term. Maybe I just never internalized it. Learn something new every day.